ABT's gala was more substantial and more varied than the usual fouette fest, and two great and very different works sandwiched a group of generally interesting shorter pieces. "Theme and Variations", even with the somewhat kitchy costumes and black backdrop, remains one of Balanchine's jewels, an intricate and facinating synopsis of Petipa. Marcelo Gomes is the perfect prince, steady and generous, and he danced the difficult variation with ease, never going for big effects, but stringing the steps into a gorgeous flow; his dancing sang rather than shouted. His princess, Paloma Herrera, looked very good, with a much softer and rounded upper body than she has sometimes shown; her legs and feet are still second to none. Her dancing at times, though, was scrupulous rather than rapturous, and the magnificent pas de deux at times seemed like a demonstration, not a conversation. 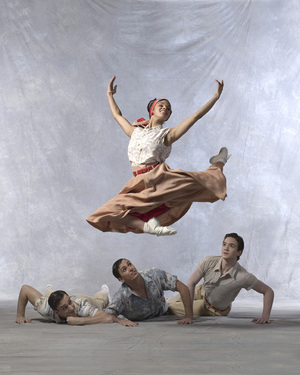 The middle series of smaller works showcased a number of dancers in a number of unusual works. Antony Tudor's "Romeo and Juliet" is a one-act work to music by Frederick Delius, and to honor his anniversary, ABT has revived the pas de deux, Romeo's farewell to Juliet. It is, for me anyway, a relief to see a Romeo without Prokofiev's bombastic music pounding away, and Tudor's restrained but powerful choreography showed a Romeo and Juliet saying goodbye without having to chew any scenery. The steps told the story economically and poetically; at one point Romeo, David Hallberg, held Juliet, Gillian Murphy, horizonally in his arms, a brief gesture that both prefigured her evenual death, and showed that leaving her was a form of dying. Death was again obliquely alluded to in Craig Salstien's solo for Michele Wiles, set to Robert Schumann's "Traumerei". This was made originally for a Dancers Responding to AIDS' gala in 2007, so the audience, armed with this information, saw the gentle defiance and lyrical resignation of the steps as a concrete metaphor. It was an very accomplished piece for a young choreographer, simple, well-made, and very promising. The same cannot be said for the excerpt from "Overgrown Path" of Jiri Kylian, which had Julie Kent, Gennadi Saveliev, and Jared Matthews jerking about portentously to Janacek. There was no jerking in the "Don Quixote" pas de deux, which, bereft of the charming solos, was an exercise in balance and turns performed by Xiomara Reyes and Jose Manuel Carreno. Carreno could charm the horns off a bull, and Reyes sailed through the fouettes flashing her fan and her smile. 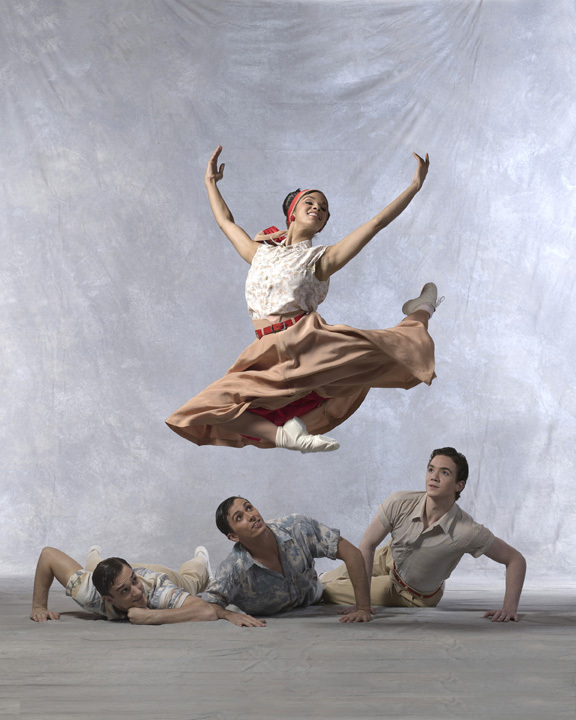 The evening closed with ABT's premiere of Paul Taylor's wonderful "Company B", set to popular songs sung by the Andrews Sisters, and evoking the youth, enthusiasm, and carpe diem spirit of Americans in World War II. He made this originally for a ballet company, the Houston Ballet, but it has become closely associated with his own company, and their more grounded style. If forced, I would have to say, perhaps due to familiarity, that it works better on the Taylor company, but it looked very good on ABT, though generally the men seemed more at ease. The women, with their slightly exaggerated forties hair styles, seemed to be conscious of wearing costumes, and Gillian Murphy, in "I Can Dream, Can't I" didn't quite capture the vulnerability or lyrical melancholy that I remember from the Taylor dancers. But Simone Messmer, in "There Will Never Be Another You", was striking, and very moving in the final, still pose. Misty Copeland, too, in "Rum and Coca-Cola" captured the raucous, flirtacious innocense of Taylor's choreography. And the men! Possibly because it was staged by the long-time Taylor dancer Patrick Corbin, so memorable himself in this, they seemed completely at home. Starting with Roddy Doble's loose-limbed "Pennsylvaina Polka", it seems as if ABT's corps is full of fine and distinctive dancers. Aaron Scott's "Tico-Tico" showcased him perfectly and his gentle bravado was both exilerating and moving. Craig Salstien's "Joseph, Joseph", with his fake glasses was a little overplayed, but his generous enthusiasm was irrestible. Herman Cornejo danced the "Boogie Woogie Bugle Boy" with bounding ferocity. He was lighter than the Taylor dancers, and I did miss the weight that the Taylor company gives it, but that may come with experience. All in all, this is a fine acquisition for ABT, and it got a truly gala performance.